By applying the Greek mathematician’s principle, a lift at China’s Three Gorges Dam moves ships with more speed and uses less power. Technically it’s ancient technology. But now the two-millennia-old principle of the Greek mathematician Archimedes has been deployed at gargantuan scale. The Three Gorges Dam, China’s marvel on the Yangtze River, is one of the world’s largest engineering projects—the product of 37 million cubic yards of concrete. Its final feature, inaugurated in late 2016, is a new ship lift, a hydraulic seesaw that raises and lowers vessels as many as 371 feet to traverse the dam. Archimedes’ notion was simple: The weight of a buoyant object is equal to the weight of water it displaces. Take two identical chambers filled with equal amounts of water. They will balance on a scale. Add an object—e.g., a ship—to one of them, and let water of an equal weight out. The two chambers will remain balanced. Remove water from one chamber, and that chamber will slowly rise. A system designed to accommodate ships up to 3,000 metric tons is a little more complex. The dam first opened with a series of locks, similar to the Panama Canal’s. The new ship lift raises and lowers boats using cables, a basin, motors—and simple gravity. Concrete counterweights in addition to water keep the system balanced, as do high-tech safety stops. 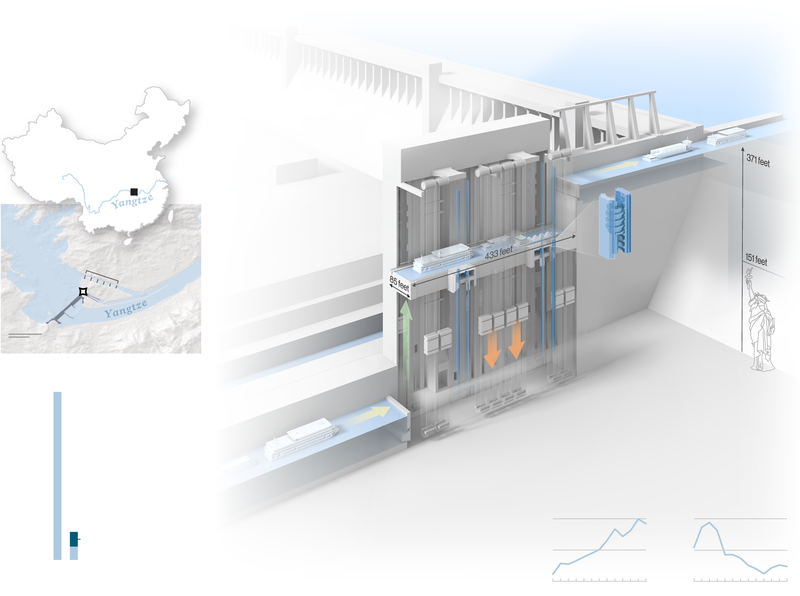 The China Three Gorges Corporation, which designed the lift with German engineers, expects several benefits: lower power needs, a rise in shipping capacity, increased passenger traffic, and lower carbon emissions—plus, the universal currency of time. A crossing that once spanned three to four hours via locks now takes just 40 minutes. it has increased economic traffic upriver but also displaced at least 1.3 million people and caused significant ecological changes. Vessels enter the ship chamber, which accommodates a draft (or depth) of almost nine feet and a height of 60 feet. The chamber can handle boats that displace a maximum of 3,000 metric tons of water, or 793,000 gallons. The chamber is made of reinforced concrete and is suspended from 256 cables attached to counter- weights. When the counterweights go down, the chamber rises. At the top of the lift, the chamber levels off with the water on the high side of the dam. A steel gate opens, and the vessel exits the chamber. The ship chamber is accompanied up and down by four static screws, called rotary locking rods. In the event of an accident, the screws, which follow threaded tracks, are locked and the chamber becomes immobile. Water can be added to or subtracted from the chamber to help raise or lower it. While gravity primarily powers the lift, electric motors are used to ensure its stability and safety, much like with an elevator. The ship lift reduces transit times from up to four hours through the lock system to less than one hour. Cargo traffic through the locks rose faster than expected after they opened in 2003, while passenger traffic declined. Other recent infrastructure projects, including the Yiwan Railway and the Hurong Expressway, offer faster routes for migrant workers through the Three Gorges region. The dam was completed in 2012 after 18 years of construction. The world’s largest hydropower plant, it has increased economic traffic upriver but also displaced at least 1.3 million people and caused significant ecological changes. The chamber is made of reinforced concrete and is suspended from 256 cables attached to counterweights. When the counterweights go down, the chamber rises. anied up and down by four static screws, called rotary locking rods. In the event of an accident, the screws, which follow threaded tracks, are locked and the chamber becomes immobile.